Mushroom Pea and Pesto Penne- a quick and easy weeknight meal. 2. While pasta is cooking, place the frozen peas in a small amount (1/2-1 cup) of boiling water. Bring the water rapidly to a second boil. Add mushrooms, cover the pan and reduce heat. Cook gently for 3-5 minutes or until tender. Drain. 3. 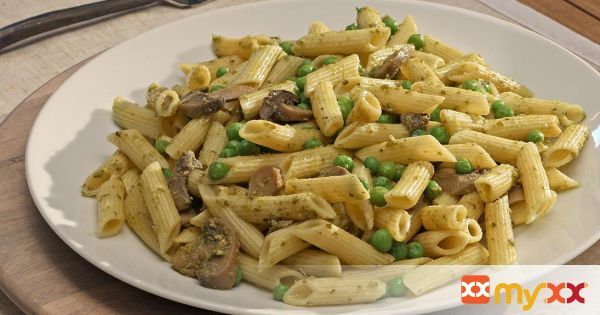 Mix cooked peas and mushrooms with the pasta. Add the pesto and stir. Add more pesto for a stronger flavor and less for a weaker flavor.